Verm-X Crunchies for Dogs are delicious treats that can be fed to your dog throughout the year as a natural method of continual intestinal hygiene control. As with all natural supplements it may take several days for Verm-X to become effective in your dog’s system, but once it does, it can provide lasting and effective comfort to their digestive system. The additional vitamins, minerals and trace elements within the crunchies formula also help to contribute to overall health and wellbeing. 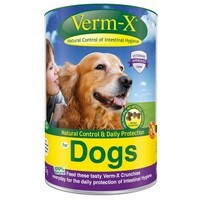 Verm-X Crunches are perfectly suitable for dog’s sensitive to pharmaceutical chemicals. Puppies can be fed half the adult amount between 3-6 months of age. The full adult amount (dependant on the size of breed) can be fed from 6 months of age. I use these alongside my dog's other treats and he really likes them. It seems to keep him healthy and does not upset his sensitive stomach.